Doris Calvin Zicafoose, 94, of Sidney, passed away at Miami Valley Hospital, Dayton Ohio, Friday, June 16th, after a short illness. She was born April 13th, 1923 in Shawnee, Oklahoma to Charles Beal Calvin and Annabelle(Hanifan) Calvin. They are deceased. She married Richard Dale Zicafoose on July 17th 1946 in Shawnee Oklahoma. He preceded her in death in 1984. She is survived by a son, Robert Dale Zicafoose(Nancy) of Cave Creek Arizona, 2 daughters, Beverly Ann (Zicafoose) Calvin of Pueblo West Colorado and Diana May (Zicafoose) Circelli (Philip) of Sidney Ohio. Doris is also survived by a Sister, Carolyn Calvin Lutz(James) of Cashion, Oklahoma. She has 9 grandchildren, Christi Zicafoose Green, Darin Zicafoose, Staci Zicafoose Rowland, Jessica Carkhuff Wagner, Brian Carkhuff, Timothy Frey, Jeffrey Frey, Russell Mowry, and Rebecca Mowry, and 15 great grandchildren and 1 great great grand child. Her daughter, Sheila Jean (Zicafoose) Frey is deceased as well her sister Charlene Calvin Beal. Life's many turns, bumps, and by-ways, including the breakout of WWII, prevented Doris from completing her college degree which she began a short time before the war. Over 4 decades later, Doris achieved her life long goal of attaining her Bachelor of Arts degree in history at the age of 68. Her youngest daughter, Diana, found it rather fun that, as a Freshman, she attended the same college while her Mother was a Sophomore. Doris worked as a librarian for 36 years at McCook Public Library, McCook Nebraska and for another 6 years at Penrose Community Library, a library that she developed from scratch in Penrose, Colorado. She retired in 1996. Doris was a Veteran serving in the U.S. M.C.W.R. (Women's Reserve of the U.S. Marine Corps.) Doris' prior experience as a riveter at Douglas Aircraft in Oklahoma served her well, as the Marines immediately assigned her as a true Rosie the Riveter for the rest of her service. 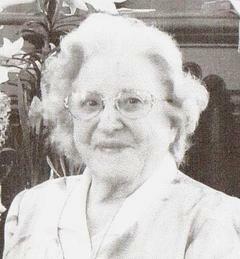 Her hobbies enthusiastically included crocheting, gardening, and book collecting. All her life Doris was a devout Christian. She was baptized, at the age of 14, at the Wesley Methodist Church in Shawnee Oklahoma. In 2013 she joined the First Presbyterian Church in Sidney Ohio where her Daughter, Diana Circelli is Pastor. A memorial service will be held Saturday, July 15th at 11 am at the First Presbyterian Church. Condolences may be left for Doris, on the Salm-McGill and Tangeman Funeral Home website at: www.salm-mcgillandtangemanfh.com. Salm-McGill and Tangeman Funeral Home a ChurchFunerals Direct Network Afilliate.